emma lamb: making everyday beautiful : who's for elevenses? 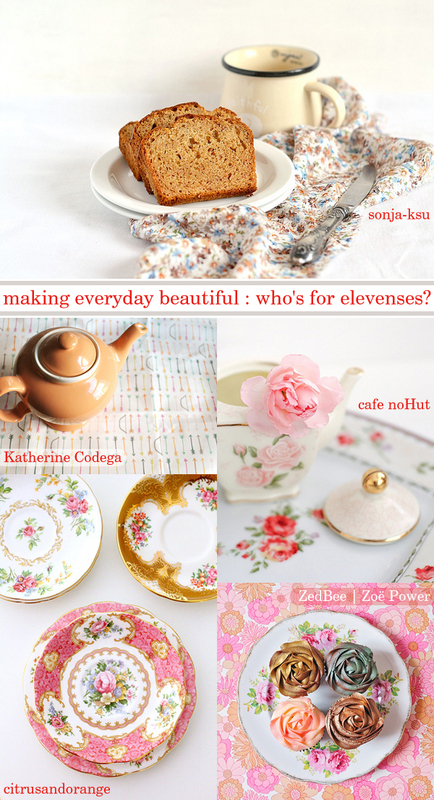 making everyday beautiful : who's for elevenses? Tea + cake + pretty china = the perfect Monday morning pick-me-up, or any morning for that matter! It's been too long since I've baked any kind of cake. My favourite has to be a chocolate brownie number I found in a kids cookbook (I'm not one for stretching myself when it comes to cake making, I know my limits all too well!) but I'm also quite partial to a lovely lemon drizzle number too. I think the latter may be a goer since I have a pile of lovely fresh lemons in the fruit bowl and a brand new box of three ginger t-bags that would accompany it so perfectly! It seems my rainy Monday afternoon is all planned out, what about you? What cakey goodness would you be baking this afternoon if you could? Remember to join us over at 'making everyday beautiful' to share the sweet moments from your everyday happenings - cooking, crafty or otherwise. Mine would have to be the Chocolate fudge cake I discovered and made over Christmas. Never had any before as it sounds so sickly, but this was devine. Very chocolatey but not over sweet....and far too moreish! Love your piccies, they really do lift a grey Monday morning. Oh yes, the classic chocolate fudge cake! My mother-in-law makes an absolutely delicious one but I can no longer sample it's delights because of all the cream... it's heart-breaking!